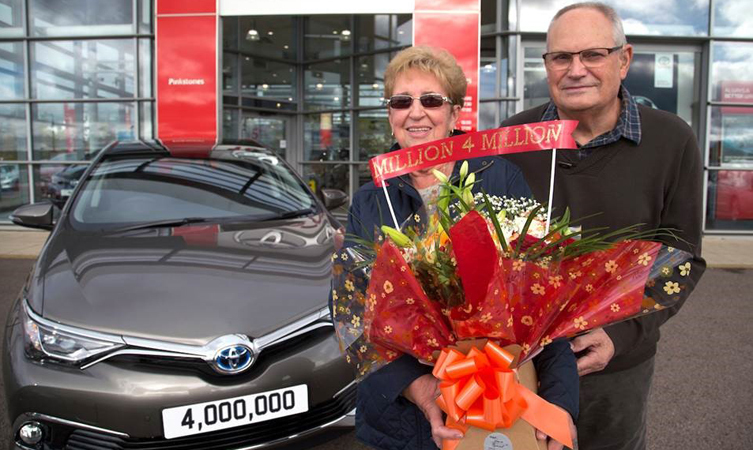 The four millionth vehicle built by Toyota in the UK has been driven off the production line, an Auris Hybrid that is now the proud possession of Frederick and Dorothy Burden, customers of Pinkstones Toyota in Stoke on Trent. Toyota’s manufacturing plant in Burnaston, Derby, and its sister engine factory at Deeside in North Wales, were Toyota’s first European production centres, opening in 1992. Burnaston has the distinction of being a Toyota global eco-plant, a pioneer of environmental best practice, eliminating waste, reducing use of natural resources, and promoting sustainable energy and biodiversity. The factory was the UK’s first car manufacturing plant to achieve ISO14001 certification for environmental management. The quality of the work at TMUK was recognised in its selection as the first European site for hybrid vehicle production, with the introduction of Auris Hybrid in 2009. Today the factory is the exclusive production centre for Auris and Avensis models for the European market. In May 2016, Toyota celebrated 10 million vehicles produced across European operations, with UK-manufactured cars accounting for almost 40 per cent of that figure. 51 cars in 20 years – is this Toyota’s most loyal customer?